Do you have a slightly shady spot where bright flowers refuse to bloom? Possibly an east facing entryway or porch, where some vibrant color is needed to welcome guests? 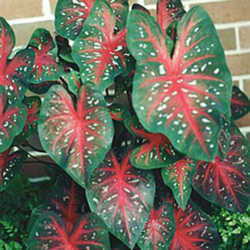 Caladiums, Caladium bicolor, are native to Central and South America, where they grow along moist creek and river banks. They thrive in hot, humid conditions, and produce brightly colored leaves that last all summer. They are members of the Family Araceae, or aroids. Other common plants in this family include Philodendrons, Skunk Cabbage and Taro. First introduced to Europe in 1704, by the Dutch explorers, the brightly colored leaves were an instant hit among the wealthy who maintained glasshouses. These plants grow from a tuber which cannot survive freezing tempratures, but can be enjoyed in most parts of the world where summer conditions allow for a warm, moist environment. Pests avoid them, and they are quite simple to maintain. Many mail-order sources are available to purchase Caladium tubers, and most big box stores offer a good selection every spring. Several grades of tubers are available, with prices ranging from very inexpensive for the smaller ones, to impressive budget breakers that are quite massive. 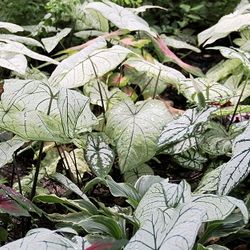 Naturally, the bigger the tuber, the bigger, and more numerous the leaves are, but regardless of the budget, there is a Caladium to fit most gardeners pocketbook. A modest investment of less than $8 netted a bag of twenty Caladium tubers in mixed colors, from a local discount store. This will be enough for a nice group of containers situated neat the front entryway. Start with containers of various sizes, planning on placing tubers of this size 6" to 8" apart,. Depending on the size of the container, this bag may fill several pots, or one very large one for a massive display. Since this container is to be used in the entryway, I placed coffee filters in the bottom before filling with a good quality potting mix. This keeps the soil from washing out of the drainage holes and making a mess, while permitting water to drain out. Fill the container with the potting mix, leaving about 3" from where the top of the soil should come. Place the tubers eye side up on the mix. The eyes are little bumpy areas on the tuber resembling the sprouts on a potato. If the tuber does not have the eyes showing, just use your best guess. The tuber knows which side is up and will eventually grow in the right direction. It just takes longer for this to happen, and the Caladiums will be later breaking ground. Cover with about 3" of potting mix and water well. 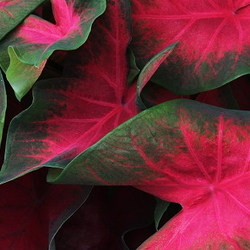 Caladiums love moist conditions, and grow best when supplied with plenty of water. Place your container in an area that is at least 70 degrees and wait for the show. Depending on the dormancy of the tubers when they were planted, leaves should start to poke through the soil in four to six weeks. Caladiums grow best in temperatures higher than 70 degrees, and should not be left outdoors more than a few hours, with temperatures less than 60 degrees. They will most likely survive, but their health and growth will be compromised. Be sure to water your container frequently during the summer. While they require a moist environment, care should be taken to not let them sit in swampy conditions, as the tubers will rot. Caladiums also benefit from regular feedings. They are heavy consumers of potash and phosphorus, and applications of a 5-10-10 fertilizer every four weeks or so will promote optimum growth. Many color variations are available, and most gardeners will be able to select a leaf pattern or color combination that will compliment nearby containers. 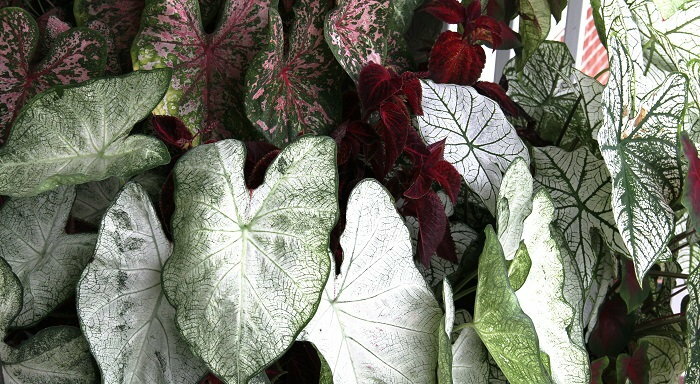 Caladiums mix well with coleus, impatiens and ferns, as they have similar cultural requirements, and the variations in leaf shape and texture, make for interesting combinations. Given this type of environment, your Caladiums should reward you with a lovely show until Autumn arrives, but you can save these tubers over the winter for another show if you so desire. When cooler temperatures arrive, the foliage will wilt and die back. You can then carefully dig the tubers and clip off the dead leaves. Let them cure in a dry spot for a few days, place in a container such as a shoebox, and store in a dark, warm spot for the remainder of the winter. When Spring arrives, repeat the procedure described in the first part of the article. Discard any tubers that have gone soft, or feel empty and weightless. In areas of the world where the summertime temperatures do not rise enough to grow caladiums outdoors, they make a cheerful houseplant. They do best indoors when placed in areas that receive some sunshine during the day. Caladiums contain a toxic substance called calcium oxalate. By chewing on the stems and leaves, swelling and burning may occur in the mouth. While no deaths have been reported from ingesting Caladiums, be alert for small children playing near them. Most incidences reported of this poisoning were for children under six years of age. The colorful leaves look tempting and might be mistaken for candy. Rinsing the mouth with water, and similar supportive care is usually all that is necessary. The problem resolves itself without further treatment in most cases. It's just very uncomfortable for a period of time. This is a great plant for many gardeners, and should be utilized more often. They provide a tremendous show all summer, with no dead-heading or pest spraying. Caladiums can brighten up dull areas and make containers glow with their lovely colors. They are easy for all skill levels, and fit the budgets of nearly every gardener. From formal plantings, to fun containers, Caladiums can add a splash of color anywhere.